Ever dream of helming a sailboat with your entire clan as crew? Well, you don’t have to be solo racer Brad Van Liew to take on Charleston Harbor. 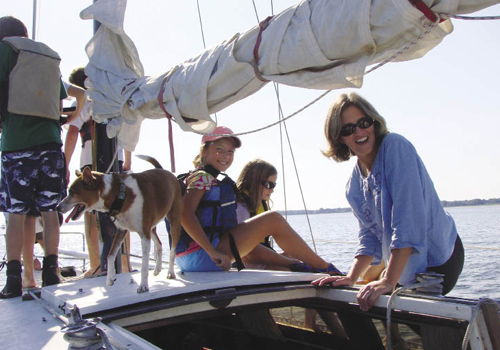 Whether you have a team of salty sailors or rookies ready to learn, Ondeck Charleston can make your family sailing dream a reality. 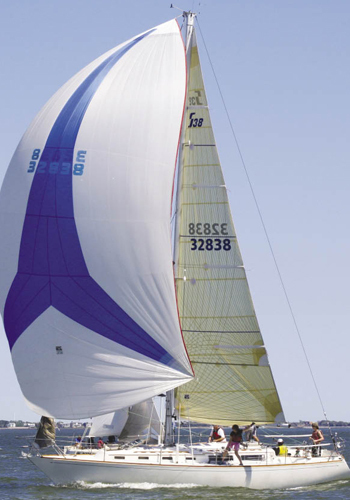 The sailing center offers a variety of classes, from half-day sails for novices to private customized curriculum to teach the whole family the fundamentals aboard your vessel or one of the Ondeck fleet. A fantastic bonding activity, sailing not only teaches your kids how to tie knots, hoist the mainsail, and trim the jib but encourages team-building and imparts confidence. Sail away with a new set of life skills and memories, or if a cruise through the harbor with a captain is more your speed, there are a host of sailing charters for hire. Total rookie to local waterways? Get your feet wet with an easy and inexpensive venture across the harbor. Charleston Water Taxi is a stress-free option for family fun on the sea and unlike other more athletic water sports, no heavy lifting is required—except for hauling your bikes and strollers aboard, if you choose. Ferrying between Charleston Harbor Marina at Patriots Point and Aquarium Wharf at the Charleston Maritime Center, the ride costs just $6 per one-way or $10 for an all-day pass. Expect friendly captains; plenty of dolphin sightings; and amazing views of the city, the Ravenel Bridge, Fort Sumter, and the USS Yorktown. 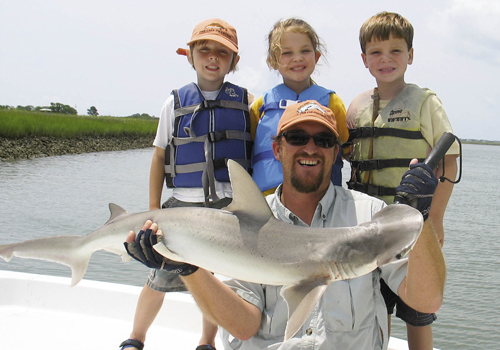 Disembark and take the kids for a tour of the aquarium or Patriots Point Naval and Maritime Museum, or just ride on. Your family will have their sea legs in no time. Hours: Sunday-Thursday, 9 a.m.-8 p.m; Friday & Saturday, 9 a.m.-9 p.m. Prefer to convene with nature—up close and personal? Then get with one of the area kayak and canoe outfitters to make a splash and spend some time introducing your kids to local flora and fauna. Out on the gated resort community of Kiawah Island, the Heron Park Nature Center offers a Pluff Mud Paddle, a short beginner’s trip on sit-on-top kayaks with a stopover for exploring the salt marsh and getting messy. 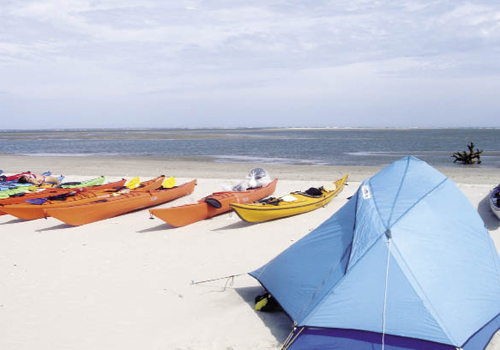 Or book a family kayaking trip in tandem boats to wind through tidal creeks with plenty of time to take in the surroundings. All excursions start at the Nature Center, a fun stop in itself, with critters, books, and all sorts of resources for learning more about local wildlife. 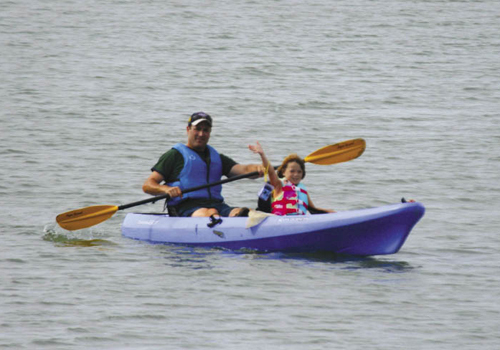 No prior experience is needed, and even smaller kids can catch a ride with older paddlers; however, participants must be at least 35 pounds and three years of age. Be sure to wear a bathing suit, shoes that won’t slip off but can get wet, a hat, and bring plenty of water and sunscreen. Call ahead to schedule a trip and/or secure a pass for the front gate. 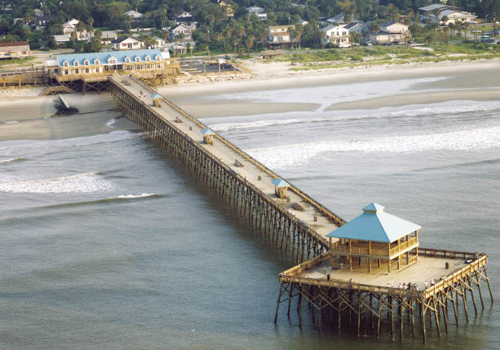 If you’re looking for family-friendly fishing without a lot of fuss, head to the Folly Beach Fishing Pier, complete with rod rentals, tackle shop, restrooms, showers, and a full-service restaurant, Locklear’s Beach City Grill—essentially one-stop shopping. Not sure about when to go and how to reel in the big one? Mr. Dee Oliver at Haddrell’s Point Tackle & Supply says it’s important to move up and down the pier with the tide. “I always suggest children use frozen shrimp for bait and a double hook with a bottom rig,” says Oliver. Teach your little one how to cast around pilings, just behind the breaking waves, or out off the end of the pier where there is a submerged structure that attracts fish. Then wait for a bite. The usual suspects include sheepshead, bluefish, spotted sea trout, whiting, king mackerel, Spanish mackerel, and even the occasional tarpon. 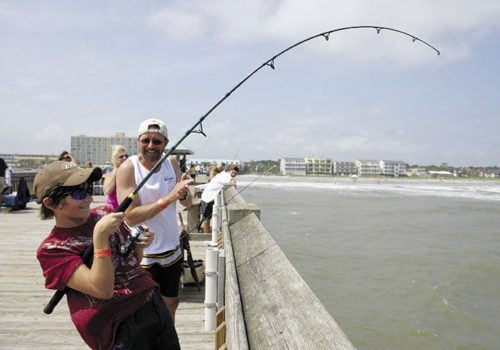 If you’re feeling lucky, enter the Folly Pier Fishing Tournament on July 23. Prefer to learn from the experts rather than embark on a do-it-yourself adventure? Look no further than a chartered trip with a licensed fishing captain. J.R. Waits of Fish Call Charters customizes family trips to suit all ages, interests, and patience levels. With a flats boat and a bay boat on hand, Waits’s charters can include backwater fishing for redfish, trout, and flounder; the inlets and beaches for the bull reds, sharks, and tarpon fishing with a stint at the jetty for awesome views of container ships, Fort Sumter, and dolphins; or even special short trips for your pint-sized fishermen. Leave it to Captain Waits to pack the tackle, bait, ice, and fishing licences; parents need only worry about snacks, drinks, hats, sunscreen, sunglasses, and a camera. That said, it’s probably not a bad idea to plan for a little pre-charter pep talk. While captains are experts at what they do, even they can’t promise a boat full of fish or perfect conditions. So prepare little ones for the possibility that the fish might take a while to bite and that, at the end of the day, the experience is more important than the number of fish caught. On the bright side, even if the fish aren’t cooperating, casting the net for bait and watching it swim in the live well usually ends up being the favorite part for the small fries on board. Prove your cool factor to your kids with some group surfing lessons. Longtime local surfer, teacher, and board shaper Kai Dilling and his friendly gang of instructors at Sol Surfers are on a mission to share the skills, love, and lifestyle of surfing—one wave at a time. 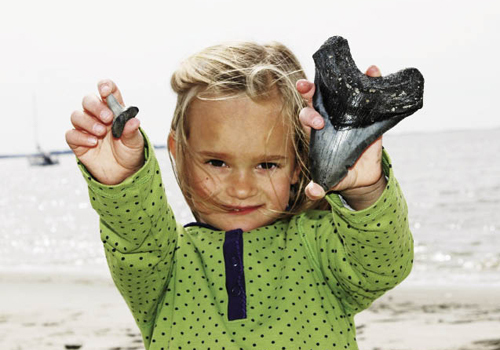 Their weekend sessions for families meet for two hours in the mornings at Folly Beach. There, you and your little groms (ages eight and up who can swim) will not only learn techniques on paddling out, popping up, and riding in, you’ll get guidance on safety, etiquette, and water and weather conditions—and have waves and waves of fun. Stormin’ The Beach at Morris Island is not just any day on the sand. Whether your crew is a gang of pirates, a regiment of Civil War soldiers, or a team of marine biologists, Captain Howie at Adventure Harbor Tours is ready to launch your imaginative bunch into an adventure rife with deserted beaches, seashells, sharks’ teeth, dolphins, and maybe even a Civil War relic or two. The boat leaves from Charleston Harbor Marina at Patriots Point and sets off for the undeveloped barrier island with plenty of tales, history, and dolphin sightings along the way. The boat holds only 12 passengers, so your group will get lots of attention. The full excursion—with approximately 90 minutes for exploring Morris Island—takes about two and half hours, so bring sunscreen, sunglasses, hats, bug spray, plenty of water, drinks, and snacks. And since Captain Howie allows dogs aboard, the whole family can enjoy this outing. 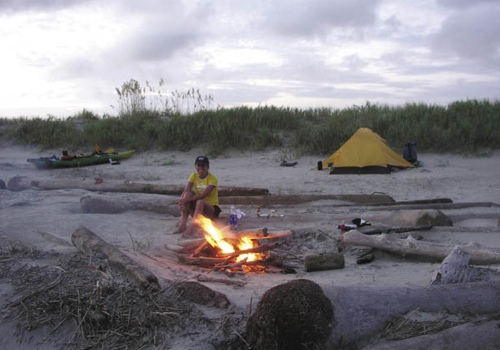 When the only thing better than a day at the beach is a night at the beach, a Capers Island camping trip might be just the thing. Think Swiss Family Robinson as you chart your way around this undeveloped and protected island north of the Isle of Palms and Dewees Island. There’s plenty to do as you commune with nature and the family on this island lost in time. Hike along Boneyard Beach with its skeletal remains of the maritime forest, or trek marshes, creeks, and trails where you may spot white-tailed deer or even an alligator. Catch your own dinner by fishing in the creek, comb the surf for seashells, and bring a field guide so you can keep track of bird sightings. Tell ghost stories by a campfire, but be sure to build it on the beach only and not the interior of the island. Keep in mind that Capers truly is a primitive site with no shelters, bathrooms, trash cans, or fresh water, so bring everything you will need and take everything back with you—trash and all—so this unspoiled oasis remains so for your next trip. A free permit is required to stay overnight and can be obtained at the South Carolina Department of Natural Resources. Arrive on your own boat, or call Isle of Palms Marina for a shuttle.